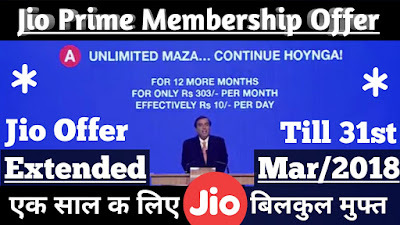 Happy News For Everyone, Today Mukesh Ambani owner of Reliance has been declared in the live streaming that jio offer has been extended for 1 year, that is up to 31 st March 2018. For this extension, every user has to do a little process. After March/2017, when jio happy new offer would be ended. Every jio customer had to recharge with Rs.99 for just activating the jio prime membership offer, which will be valid till March/2018. But after this activating process, every jio user should have to recharge their jio number with Rs.303 per month, to get the offer. The user should get unlimited data offer but 30gb high-speed data per month. And per day 1gb high-speed data, after that, it will run but at a slow speed. 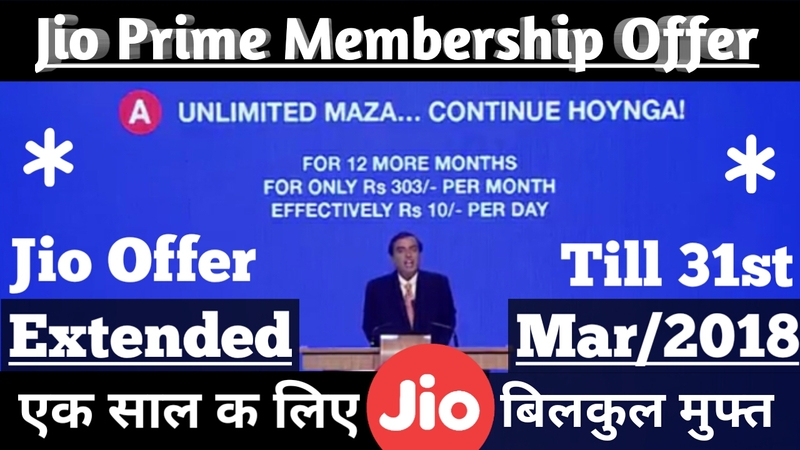 So I hope everyone is happy with the latest announcement of Mukesh Ambani, and everyone would enjoy this offer.